Built to handle tough loads, this versatile, heavy-duty jumbo wagon makes light work of landscaping and gardening tasks. 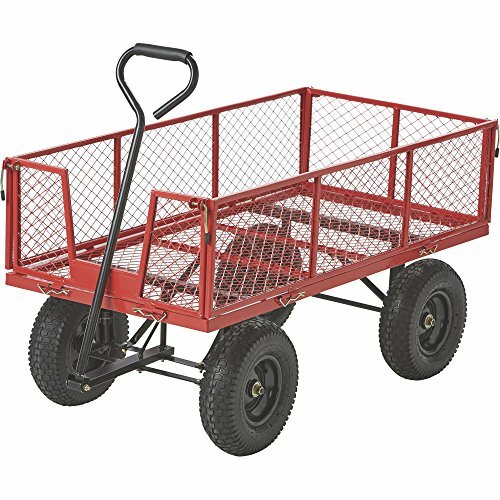 The durable steel frame and steel mesh deck can easily hold up to 1400 lbs., so this wagon is ideal for hauling patio blocks, firewood, lawn equipment, garden supplies, and other bulky items. The front, rear and side panels fold away or detach completely for simple loading and unloading. The smooth-rolling 13in. dia. pneumatic tires, yoke-style steering and comfortable cushioned handle make it easy to maneuver the wagon over varying terrain. Measures 50in.L x 24in.W x 26.75in.H.